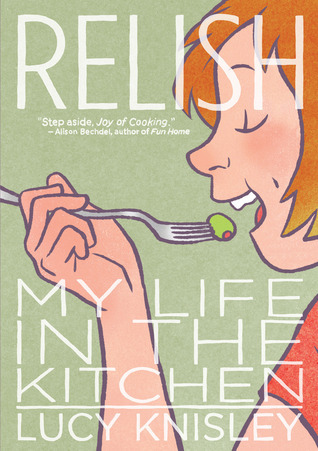 Relish: My Life in the Kitchen is a memoir in comic form about the author's life experiences with food. I read it over the course of a couple of nights and really enjoyed it - though I highly suggest you read it when you have delicious food in the house and not when you are in the midst of a grocery shopping drought like me. It's a little depressing to read a book about the joys of cooking and eating well when you yourself are eating Morningstar buffalo wings and whatever you can salvage from a bag of green beans. But other people plan their grocery shopping better than I do! And Knisley does spend some of her book defending the joys of fast food restaurants and Ramen soup, so I didn't feel so bad. And honestly, Knisley is such a bright and cheerful person who draws such bright and cheerful (and colorful!) pictures and shares such bright and cheerful food stories that it's impossible to feel bad when reading this book. I'm a big food lover myself, so I can identify with Knisley's inability to separate places she's visited from the food she's eaten while there. And the way she talks about potluck dinners and having friends over to share a meal - I absolutely agree with her, it's one of my favorite things in the world to have or attend a dinner party with close friends. This book doesn't have a plot. It is episodic in nature, starting with Knisley's childhood first in Manhattan, and then in upstate New York, through trips to Japan and Mexico and then her college stint in Chicago. She ends each chapter with a recipe (shared in a lovely cartoon format that I thoroughly appreciated), and throughout the book she has a lot of other really interesting tips and tricks. For example, she has a two-page spread on cheese that I found fascinating and even shared with my boss at work the next day. I also loved the section on Chicago, mostly because I am one of those people who gets SO EXCITED when she can recognize places that are referenced in books or on screen. And Lucy went to so many fun places in Chicago and sometimes they'd be behind her in the drawings or I could just get a hint of them at a weird angle or she'd talk about the restaurant by name and I would just be so thrilled. I also think Knisley is much more down-to-earth about her food than a lot of food writers are. While she grew up on all sorts of gourmet dishes and enjoys them, she also likes McDonald's fries and Ramen soup. She points out that America is still growing into its food culture and that we can all help shape and define it in a way that fits us best. And that sometimes, if you want something to taste really good - you should just buy it from a professional! It's a refreshing and fun take on food culture, and one that I really enjoyed. I know, they're so mean! I am not a fan, either. Definitely! OR let's rendezvous and I can give it to you face-to-face. I read this awhile back and it's so good. Joanna's so right about the episode with the geese. It was hilarious. So envious that you've already read it. IT'S HIGH ON MY WANT LIST. Caps-worthy, too. Andi! I miss you! And I think you WOULD really like this book! Most of the graphic novels out there seem to be so sad, and I am glad that you found this one delightful and that you recommended it! 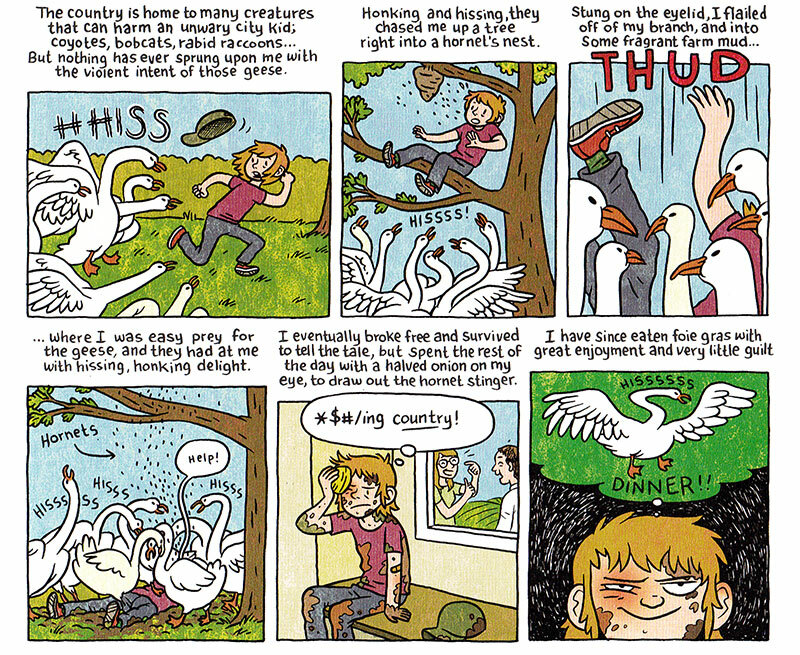 I have been looking for a fun way to dig in to graphic novels, and this sounds like it. I have a few here, but they are all so sad and dark. This is light and fun, and just what I need! And by the way, I can relate to those bad grocery days when all you have in the house is yogurt and Morningstar corndogs! Very nice review! I am off to get this one right now! Gooses ARE jerks. I have never met a group of geese that I never saw doing something mean. Plus they poop everywhere. GEESE. I love Lucy Knisley's art! Have you seen the cartoon versions of the Harry Potter books that she did? Sounds a lot of fun, especially the recipes being included. I'm one of those people too, there's nothing like knowing exactly what the author is talking about in terms of location. It can often make a bad book seem better, too. this looks adorable. i read her earlier book about paris and enjoyed it, so maybe i'll look out for this one too! Did you ever read French Milk? I can't remember. That book surprised me on how much I enjoyed it (figured I'd just be real cynical about some chick who expects us to care about what she ate in France...but I wasn't! ), so I've been looking forward to another one by Knisley. Have you read To Timbuktu? Another graphic novel all about travel that I discovered after looking for French Milk readalikes.